A car drove through a church wall in Ohio on Sunday morning, injuring six people and shattering the stained glass. The firefighters said that the six wounded of the Crossroads United Methodist Church in Columbus were treated for cuts and other injuries. Rev. Jay Anderson said the members sang a hymn as the car crashed through the wall. He said that the wall was "just exploding" and that broken glass was flying. He said the church was unusually crowded because of a special Christmas performance. A car crashed on Sunday, December 23, 2018, in Columbus, Ohio, at the entrance to the Crossroads United Methodist Church. During the incident, about 100 people were in the church. Marie Winnestaffer was sitting in a bench hit by the car. "I did not see anything, I just went out with the electricity, he pushed us across the aisle," she told the Columbus Dispatch. "It felt like a bomb." 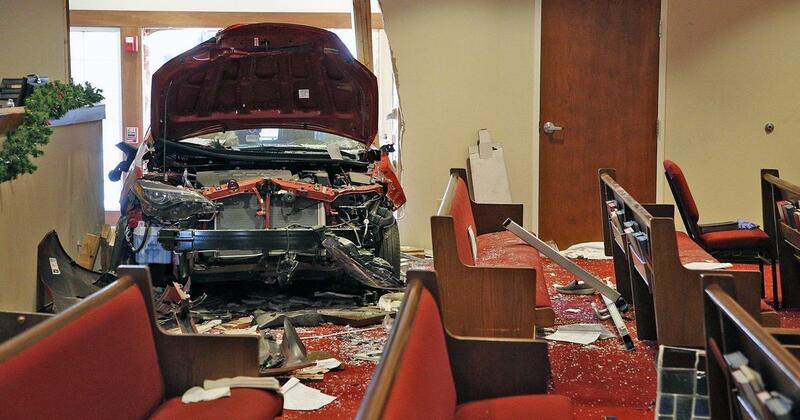 The crash left a wide hole in one part of the church. The police did not identify the driver and did not say if any charges were planned.